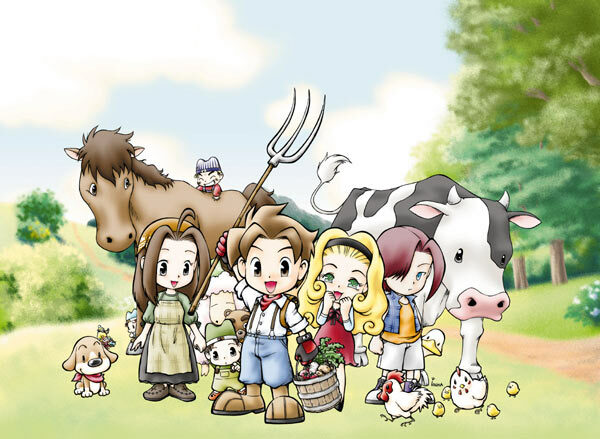 Well, in Harvest Moon, you are a young farmer (male or female) who begins your life in farmer's job. You have to take care of your animals, grow crops, you marry and probably have a children. In my forum, you don't has obliged to be a farmer (fiouuu ! ). You can be a doctor, a carpenter or anything else. You can be the Harvest Goddess, the Witch Princess or the Harvest Sprites ! The time fly really fast in this forum. For 1 years pass, 4 months have to go...it simple. 1 month is 1 saisons of the 4 saisons. The festival are distribued in the month. The day in a month is 30 day. So, if we has in a month finished by 31 day, the 31th, we don't really play, just prepare our thing... In the february month(In the really life), we will retire 2 days. I will say it. If you know what Harvest Moon is and played it, you can skip this part. In Dougy's forum, you don't have to be a farmer. You can be a doctor, a carpenter, or almost anything else. You can't be the Harvest Goddess, the Witch Princess or the Harvest Sprites since they were taking by other players. You can have a avatar like them though. Time flies fast in the forum. In this game, 4 months(Real time.) have to past for to be a year. (In the forum.) The events will come in the months they are order into. (I posted what it will be in real months at the portal.) The day in the months(Game. )is 30 days. So if we have a month(Real time.) that has 31 days then, on that day we will get ready for the next month. In Feb., since there are only 28/29 days we won't play on that last day. I am not doing events. Look at Dougy's thread. Yes, in this forum you don't have to mary. You can just fall in love and boyfriends/girlfriends. That is all and thank you for reading.